grub2-signed can not find the right device when there are two filesystems containing the file '.disk/info'. [Impact] When using UEFI, GRUB doesn't always determine the correct boot device to chain to if multiple Ubuntu bootable media are attached. [Regression Potential] When I fixed this in saucy, I made a mistake that broke UEFI Secure Boot (fixed in 2.00-18ubuntu4). I made sure to cherry-pick that fix as well here, but it's worth testing both paths. 2. Use this USB drive to boot "Try Ubuntu without installing" on an UEFI secure boot enabled laptop. 3. Create only one 1GB primary fat32 partition on the disk of the laptop with GPT-based disk layout. 5. Manually copy all contents from the USB stick into the fat32 partition. 6. Set up the EFI boot entry. 7. Append 'from recovery partition' to every menuentry title in /mnt/boot/grub/grub.cfg . 8. Reboot and select the boot entry 'recovery' from UEFI boot option menu. We can see every menu entry of grub with the suffix 'from recovery partition'. There is no suffix 'from recovery partition' on menu entries of grub. P.S. The USB drive is still plunged in the laptop. After we unplug the USB drive and select the boot entry 'recovery' from UEFI boot option menu, we can see every menu entry of grub with the suffix 'from recovery partition'. We have to find /boot/grub somehow in the signed memdisk configuration (generated in debian/build-efi-images, if you're curious), but none of the solutions I initially thought of work here. The filesystems are identical because they were copied, so we can't leave any clues in the file names or contents. Filesystem labels are reserved for sysadmins to set - at least if you're at all sensible - and we can't realistically bake a filesystem UUID into the signed memdisk configuration because we'd then end up changing the UUID of the filesystem containing /boot/grub and that doesn't sound like a great plan. But I need to do some testing to check exactly how the boot process behaves in a few different cases, and possibly add more sanity checking there to make sure that ($root)/boot/grub exists before committing to it. The way we're calling grub-mkimage causes the prefix to be overridden to (memdisk)/boot/grub, which isn't terribly helpful. Switching the order of -m and -p on the command line improves things here, and then I think it may just be a matter of checking whether $prefix already refers to something that exists on the filesystem before going around searching for things. I think I've sorted this out in my most recent bzr commit. However, I want to make sure I haven't broken hard disk booting of signed images; I'll do that by way of blocking the upload in saucy-proposed for manual testing. I try to backport the patch into precise to make a test, so that I can verify if it could fix the issue in 12.04. I found the code is very big difference, the patch doesn't work for precise. And I also try to build source from the latest grub2 in your lp in my pbuilder. Below is the log. After download the grub2_2.00.orgi.tar.xz, it build success. And is there any clue to let this fix in precise? Thanks! I downloaded the daily-live cdimage in 20130913.
then go into the recovery partition, show the restore UI. 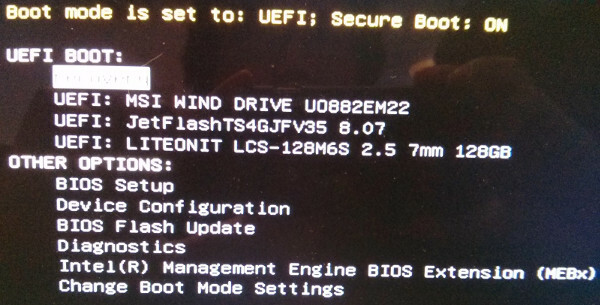 2) Secure boot Disabled and set "UEFI First" in "UEFI/Legacy Boot Priority"
then reboot the laptop ceaselessly. 3) Secure boot Disabled and set "Legacy First" in "UEFI/Legacy Boot Priority"
Startup into the installation UI, works fine. Again, I tried the ubuntu-13.04-desktop-amd64.iso, just a little difference. Just go into the recovery partition, show the restore UI. What can I do for you to help locate the reason? Thanks! The messages about \EFI\BOOT\fallback.efi are harmless noise from shim; you can disregard those. Do you have any way to confirm that it's actually booting from the CD when in secure boot or UEFI-first mode (e.g. drive noise or activity lights)? Sorry for reply late, and the boot from CD is very quick, just like checking CDRom, I'll check it today. I have verified ubuntu-13.10-beta2-desktop-amd64.iso by the steps of the bug description and it works fine. Hi $4, do we need this to be fixed in precise as well? Yes, we do need this fix in precise as well if we want to deploy UEFI secure boot on OEM projects. I just download the 20131016.1 daily live cdimage, and record it into DVD, then boot up from CDRom. When secure boot is disabled, and UEFI first, it's just hang after the "error: variable 'root' isn't set." When secure boot is enabled, it will boot up to recovery partition, I can hear the drive noise when select boot from DVD driver. When it's in the UI of restore, I switch to tty1, you can find my recovery partition /dev/sda1 is mounted as /cdrom. And from dmesg log you can find the kernel's boot parameter. And I create a bootable USB with the same image, when boot up from USB, it works fine. And I also verify by 4$'s comment in #13, I can see every menu entry of grub with the suffix 'from recovery partition'. Might be the original issue is fixed. But from the title, the issue from DVD image also caused by the partition which has .disk, so should I open a new one for the issue which boot up from DVD? Thanks! And it's easy to reproduce. 8. Use `brasero` to write saucy-desktop-amd64.iso to DVD disc. 9. Reboot and select the boot entry 'ATAPI CD0: PLDS DVD-RW DS8A9SH' from UEFI boot option menu. We shouldn't see every menu entry of grub with the suffix 'from recovery partition', cause we start from DVD drive. There is suffix 'from recovery partition' on menu entries of grub. Can you use UEFI secure boot via DVD drive successfully? I have tried two different laptops but they both failed. I del the grub.cfg in recovery partition, after that it will enter grub shell. from the result, I thought the $prefix is zero or not exist. And another issue when I run 'search --file /.disk/info' in grub-shell, it will reboot my laptop. Is it a bug? Thanks! @Bin Li: This sounds like it could be a firmware-specific issue. The prefix is supposed to be derived from the EFI Loaded Image Protocol, which is really the only way I'm aware of to implement the feature requested in this bug report in a reliable way. If it doesn't work on your firmware then we have a deeper problem. And yes, "search --file /.disk/info" rebooting your laptop is absolutely a bug, although one that should be filed separately. This could well be related to the broken/missing prefix. One possibility is that this is a problem with EFI stack alignment; I mention that because it was recently fixed upstream. I expect to have a recent upstream snapshot in trusty in the next week or two, which would be worth testing. Until then, I think it would be best to leave verification of this bug to Shih-Yuan Lee, if that's OK, to avoid clouding this issue with what sounds like a separate problem. Accepted grub2 into precise-proposed. The package will build now and be available at http://launchpad.net/ubuntu/+source/grub2/1.99-21ubuntu3.14 in a few hours, and then in the -proposed repository. After test it in precise-proposed, I found the signed efi image is still 3.10, while not ubuntu3.14. Could you help update this file? Thanks! And anyway, from the daily build image, we still met this issue. Form #21, looks like the $prefix is zero or not exist, so I'll set it as verification-failed. so we can do a proper build. Today's daily build should have an up-to-date version of GRUB. Please retest. Also, I would prefer somebody who was able to verify the fix in saucy to do the testing, to avoid clouding this with other issues. See my comment #23. And a question, is there a way to check the $prefix's value before search? And the $prefix was set by grub-mkimage with '-p' parameter? Thanks! My given name only has one "l", FYI. to sign the image, and try booting it. > And the $prefix was set by grub-mkimage with '-p' parameter? otherwise it will leave it unset. prefix would perhaps imply that it picked the wrong GRUB drive. http://paste.ubuntu.com/6565622/ is the test result from Ubuntu 12.04.3 LTS "Precise Pangolin" - Release amd64 (20131212). And I thought the new package have improvement, it's the direction which fix our issue, I mark as verificaiton-done. Next I prepare open a new bug to find why the prefix not set correctly with the clue from #31. I'm going to release this since there are other important bugs fixed in this update and as far as I know it doesn't make this bug worse. This bug will probably be auto-closed, but I'll reopen it. * Handle FAT filesystems on non-512B disks (LP: #1065281). * Probe FusionIO devices (LP: #1237519). just set timeout_style=menu and make sure the timeout is non-zero. * Fix mismerge of GRUB_RECOVERY_TITLE option in 1.99-21ubuntu3.12. mode" text to be customised (LP: #1240360). The verification of the Stable Release Update for grub2 has completed successfully and the package has now been released to -updates. Subsequently, the Ubuntu Stable Release Updates Team is being unsubscribed and will not receive messages about this bug report. In the event that you encounter a regression using the package from -updates please report a new bug using ubuntu-bug and tag the bug report regression-update so we can easily find any regresssions. Now in Lenovo's laptop, we still meet this issue on trusty(14.04.2). I delete the grub.cfg in recovery partition, after that it will enter grub shell. The file debian/build-efi-images of package grub2-2.02. Grub executed the "search --file --set=root /.disk/info" first, try to find out the "root". Because .disk/info was exist on USB stick and HDD0 Partition2, so the result included 2 results. But the USB stick was the first. So the grub.cfg on USB stick was loaded and the system was booted from USB stick. We still suffer from this issue for Ubuntu 14.04. 4$, do you get the exact same behavior in 14.04 as you initially reported for 12.04? What I think I can infer from the matrix you posted before is that search doesn't prefer the current boot location if it finds a file in the search command on that disk. Otherwise, things tend to be listed with USB drive first, then hard disk, then CDROM (at least, here as well as on the pastebin you posted), which appears to be a static order in which things are detected by grub (in other words, unrelated to BIOS boot order, at least). GRUB should follow the UEFI's BootCurrent to find the root instead of checking the existence of /.disk/info or /.disk/mini-info. Or you can put UEFI's BootCurrent device or partition in the first order to check when running `search --file --set=root`. In short, if GRUB never checks UEFI BootCurrent, the issue is impossible to fix. Indeed you can use BootCurrent (or, as grub already provides that, use $cmdpath or some variation of it) to specify the right device as a basis for where to search for the files. Rather than simply using search --file --set=root /.disk/info; I think we can make use of hints to specify where to search first. I've experimented with this over the past few days and it looks like it works properly. I've also prepared a patch to grub to provide an extra environment variable "$bootdrive" that would include just the disk specification for the device used for the EFI booting -- in other words, while $cmdpath contains the full path to the directory containing the EFI binaries used to boot ((hd2,gpt2)/EFI/ubuntu); it would contain just the drive without partition specification (hd2 in the same example). Then, 'search --file --hint=$bootdrive --set=root /.disk/info' appears to return the right paths according to my tests. I've sent the patch upstream (waiting to see that it was indeed received on the mailing list), and I'll do one final run of testing to make sure this behaves properly before considering an upload first to the current development release (since it does appear to be reproducible there still). Your solution looks good. Thanks for your effort. BTW, the GRUB script is embedded in grub2-signed so only the maintainers of grub2-signed can modify it. We, downstream OEM projects, can not modify it because we need to support UEFI Secure Boot. Yes, that will be fixed shortly, I was just waiting for review from the grub developers. One question that remains is whether searching is in fact still necessary, which might further simplify the EFI images. In my personal opinion, searching for .disk/info is unnecessary for UEFI BIOS if GRUB can find the right device from BootCurrent. However I am wondering if legacy BIOS still needs it. Oops, sorry for my previous bad comment. Legacy BIOS won't use grub2-signed. Is there any update for comment#44? It's a bit hard to make sure I'm hitting all the right cases, but it did look (with a fairly recent grub) like searching was unnecessary. This would make the changes pretty small. Yes, I can help to verify it once I have the ISO image. I've done my own testing on my side and unfortunately it seems like hinting the search command isn't sufficient to make this work -- there's definitely also the need to patch is some more to not use cache when hinting the command, so that things appear in the right order. This said, I've had review on the $bootdrive patch and there's been some rightful pushback: there's a way to get the same thing via regexp, and we should otherwise make sure we're not unnecessarily duplicating variables (since there is already $cmdpath; though there is so logic to having a $grub_bootdev and $grub_bootpath separation). Since it was suggested, I've looked into using regexp to retrieve the boot device name, it looks like it might work to remove the need to search for the right root device, but given that this is run in a UEFI context, there could be security implications to using regexp -- I've asked Colin Watson to weight in on that. Milestoning to ubuntu-17.03 so it shows up better on my todo list. I haven't forgotten, but there's consistently been other tasks taking priority. With some similar work we've done for snappy, it should become easier to fix this issue.